Our seventh child, Emilia James. Yesterday, the topic of abortion came up in conversation with our two oldest children, ages ten and nine. I’ve mildly dreaded discussing this topic because our children remember two of our late miscarriages and how traumatic it was to have our babies die. I didn’t know how it would go for them to find out others have made that choice electively. Reality is- I didn’t give them enough credit. The policy in our house is that no question is off limits. And while we may say, “I’m not ready to answer that.” we have promised our kids we will not lie to them. Often times, we will respond to their questions with, “What do you think about that?” to gauge where they are in their understanding or better catch the context of their question. As we dove into the subject and their questions, we could see heartbreak on the faces of both our kids. I am currently 35 weeks pregnant with our seventh child. In 2015, we lost two children to miscarriage and I was far enough along, I had to go in to have their dead bodies surgically removed from my womb. These were traumatic experiences and we all grieved together. This topic is not theoretical to my children. They connected immediately that abortion is the same sort of procedure in which a live baby is taken from the mama’s womb. We explained that this is a very sensitive subject and that there are political movements called Pro-Life and Pro-Choice. We explained, as unbiased as possible, the stances of both parties and their beliefs. One of the kids asked, “So what are we?” and Brett explained that each of them needs to take time to search their hearts with Jesus to make those kinds of big decisions but to remember that the issues are rarely as simple and black and white as people want to imagine. As we navigated more, I asked the kids if they could imagine some situations in which a mama might feel abortion is her only option. They could both identify a few legitimate ones: divorce, no money, she isn’t safe, she’s young and not married, etc. I was so impressed with their ability to put themselves in a woman’s shoes in the midst of their clear distress of the killing of babies. In the end, we explained to the kids that it is important we do not judge and we are filled with compassion for women who have made this choice. I explained that I’m sure many women live with a lot of regrets and possibly shame, probably even women we know and love who have never felt safe to talk about their abortions. So there you have it. My preteens were not only able to have a great conversation about a difficult topic rooted in love and compassion but also understanding and a concrete foundation that Jesus loves us all- no matter what. Not only does He love us really well, but that He meets us in our grief, shame, loss, and all things. How different would the world be if we all kept those truths at the forefront of how we speak to and treat one another? On this Easter weekend, I hope we remember our Savior died on the cross and rose from the dead for every one of us, no matter our history. Years ago, I had the idea of not only regularly dating and pursuing our kids (which we do) but annually taking them on a fancy date. The kind where you get dressed up, go out to a nice sit-down restaurant and treat them to a lovely time. I do not love celebrating Valentine’s Day between Brett and I (I’d prefer he and I pursue each other that way all year round when the cost of flowers and chocolates are not doubled) but thought we could use the annual holiday as a reminder that it is time to take the kids out. Let’s be honest, if we aren’t intentional with things like this, they get away from us. Also, February is a month without any of our family’s birthdays, etc so it’s a nice time of year to do something fun. We have been taking Elle and Johnny on these fancy dates for seven years now. They have come to expect getting dressed up, taking pictures, and doing the whole romantic night out. It’s become their norm that mom and dad would spend that kind of money on them and go to such lengths to spoil them with affection and adoration. They know people (usually our servers and on-lookers at the restaurants) will compliment them on how nice they look and friends will honor them from social media posts. Essentially, while this is not our normal dating ritual year-round, they have come to love these special times and are comfortable with the love and affection that comes with them. They know they are worthy of it all. And that is the point. I desire for my kids to know that they are loved, wholly and completely, regardless of their performance, behaviors, successes, or failures. I want them to know and expect that they’ll be treated with respect, kindness, and so much more. Further, I hope to teach them that ALL humans are worthy of this same treatment. This year was especially fun because it was Esther’s first fancy date. She is two and doesn’t quite get the concept. In preparation, we allowed Elle to go the night before so Esther could see what all goes down. All the while I helped Elle with her hair, makeup, and outfit choices, Elle spent the time explaining to Esther that she would get to do the same tomorrow. She described that daddy will likely have flowers or a special gift for her and to be sure to say “thank you”. She told Esther that “you are a princess and daddy is like your prince. He will take to you get some yummy food and tell you how wonderful and pretty you are the whole time.” You see, Elle has already caught that there is more than enough love to go around. She is not threatened that because Esther (and eventually Emilia) will have a turn with daddy that her time is diminished or any less special. In fact, Elle even asked to add a movie to their date this year, fully expectant that Brett would love to do that with her. Brett and I take our children out on these special dates to imprint in their hearts that this kind of love and affection should be their normal and that they can pass that same honor and abundance onto others without hesitation. The Bible says that “We love, because He first loved us.” (1 John 4.19) Our children will have the ability to pour out extravagant love to others because they have grown up in a home where they are extravagantly loved. Because of this, my children will be world changers. Lastly, there is also the practical side of this. Someday, my children will go to their first school dances and get asked out on their first dates. I want my children to know how to expect to be treated and how to treat the wonderful person on the other side of the table. I want Elle and Esther to know it’s okay to stand back and allow a man to open her door, pull out her chair, and show other signs of honor. I want Johnny to comfortably navigate a conversation with a lady at the table while asking questions and listening to the answers. I desire for my children to walk confidently into these rights-of-passage moments in life knowing they are a prize to be delighted in and that the person they are with is equally loved by God and deserving of their honor too. How will they know this if I haven’t taken the time to teach and model this myself? Lastly, I want my children to feel empowered to boldly stand up for themselves and others when they’re not being treated with honor. The only way they can do this is if they’ve experienced enough real love to acknowledge and spot a counterfeit for what it is. We consistently have conversations in our home about protecting others who cannot protect themselves and standing up for what is right at the hardest moments. We don’t always get it right but we are certainly doing our best to love big and teach our children to do the same. Early last year, Brett and I prayed and decided to have one more child. It took us months to conceive (which has never happened before) and I found myself processing with the Lord a lot about why. One day, in early June, the Lord spoke clearly to me and said a word that I wasn’t familiar with. I looked it up and the word meant, “Behold, a son”. I treasured it in my heart and only told Brett. It was a huge encouragement for me as we finally conceived and waited to find out the gender. Brett and I tried to hold it lightly, knowing we can definitely miss it sometimes, but we started praying about boy names and came up with the perfect one. We only mildly considered some girl names, just in case. 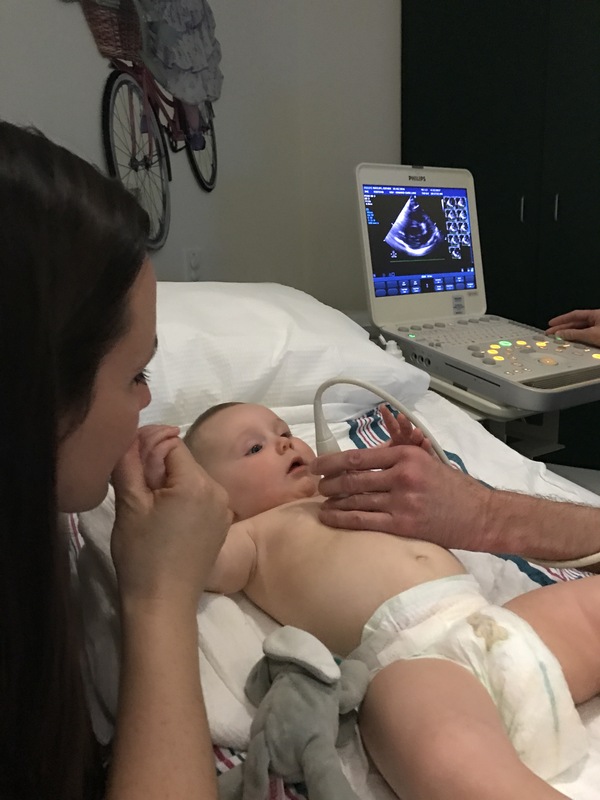 Last month, as we headed in for the ultrasound, I felt so excited and nervous. It was time to find out if I did indeed carry the boy our older son, Johnny, has prayed for the last four years. The tech got a perfect angle and excitedly announced, “It’s a girl!” I was SHOCKED, but my heart leaped as I immediately pictured Elle and Esther as newborns and I knew I would love her just as much. It wasn’t until we were waiting to see the doctor about a half hour later that the reality of announcing this to Johnny began to hit me. I panicked, thinking of his broken heart and disappointment. I immediately told Brett we needed to get a puppy. I wasn’t joking. As I began to think about how hard this news could be for Johnny, anxiety swelled and my own protective anger grew. I found myself wrestling with joy for a beloved daughter that I was surprised and delighted to meet via ultrasound. (She really is the cutest thing!) But the anger of how sad my son would be and confusion of why God said what He did to me was building too. We couldn’t find a puppy on such short notice (praise Jesus) so we bought a massive balloon filled with pink confetti and headed home, praying for our kid’s hearts. As Johnny popped the balloon, he smiled wide with shock and a “you have to be kidding me” look on his face. Elle, on the other hand, was just shocked. After the initial excitement wore off, she welled with tears and said, “I don’t understand. I really thought it was a boy.” This was news to me as she hadn’t expressed that expectation out loud. My anger grew. Slowly but steadily, I found myself frustrated that we were all having to deal with the loss of a dream instead of just celebrate. Then I’d suddenly feel ashamed and frustrated with myself that it was even an issue. Of course, I am excited for this daughter we’ve been given. Her pregnancy has been a breeze compared to the previous six. She’s already been such a delight and will be a huge blessing to our family. Why couldn’t that be the only feelings we were all feeling? Then it hit me. I feel disappointed. Not that I am having a girl. But that we are not having the boy we thought we were. That the boy we’ve all hoped for and dreamt of doesn’t exist. Oh, how the emotions came then. The anger raged and the shame of feeling disappointed began to swallow me. I wanted to run, to numb, to do anything but feel everything I was feeling. I spent two days trying to process with the Lord. At this point, I know running from feelings doesn’t work. I’ve also given up all of my numbing techniques, like drinking, so that wasn’t an option. I felt I got nowhere with my journaling. I cried many times to Brett expressing my anger, but mostly frustration. I didn’t want to be disappointed and I certainly didn’t want the baby experiencing anything I was. After two days of circling and crying, I woke up the third day and put worship music on full blast. I danced with Esther until the big kids woke up then invited them to join. As I stood and worshiped in the midst of my big feelings, thanking God for the child He’s given us and the safety I have to honestly process my disappointment with Him, it all began to lift. The heaviness, the anger. It began to fade into the distance and my heart finally felt free to actually celebrate in what we do have and the truth that God’s ways are higher than my ways- and that is good news. I still don’t know what to do with the word the Lord gave me back in June. But I don’t have to yet. If I’ve learned anything in my years of loss and grieving it’s that we don’t always get an answer this side of Heaven. What I learned this month is that while I am fine dealing with disappointment over something I deem big or worthy of disappointment (like losing children to miscarriage), I really do not like even admitting I am disappointed over something I consider selfish or small. But the reality is, God cherishes my process, even over the smaller things. He’s not afraid of my honest anger, disappointment, or even my ugly behavior as I process. He is delighted that I trust Him enough to be honest and share my feelings. He’s more than happy to walk me through my thoughts and emotions. And when I am brave enough to praise Him in my pain, He is faithful to trade me joy for my mourning. If you’re dealing with disappointment of any caliber today, know that there is a God who is interested in healing your pain, but more importantly in walking the journey out with you. There is no issue too small nor too big. He loves to be a part of it all. He loves to walk out every part of the process from beginning to end if only we will trust Him with our hearts, our emotions, and our journey. I pray you are met by the Prince of Peace today and in all circumstances. When my hair gets heavy enough that I’m getting headaches, I cut it. Otherwise, I let it grow because I love having it long. Last week, out of nowhere, the Lord gave me a vision of chopping my hair. It was clear, short, and the message was simple. I waited for a few hours to say or do anything because it was so out of the blue and not something I had thought of AT ALL. Later that day, the same vision repeated in my mind’s eye and I knew He was up to something, just not what. I positioned my heart with a yes and moved on with my week wondering if I’d get more revelation on the significance. Yesterday, I felt like I needed to act on my yes so I called to book a hair appointment, assuming it would be weeks before I could get in. Instead, they had an availability at 10am today- so I took it. Last week I spoke to my teens on the importance of denying fear by giving the Lord a hearty “Yes!” in immediate obedience because everything He has for us is for our good. I figured it was time to put into practice what I preach. This morning in my journaling, I asked the Lord about this haircut. He said many things, but I’ll share a few: Jesus sweetly revealed that cutting my hair today is symbolic of the pruning He’s been doing this year while I’ve been at school and that the old things are being stripped away and cannot reattach, just like cut hair cannot be put back on. He spoke to me about self care and the new freedom I will walk in to care for myself in love without shame or apology. Finally, Jesus spoke honored me for having grieved well and said this is a point where I can close the door on my grieving chapter and move forward, not forgetting my Heavenly children, but living freely and fully- in honor of them. I have never been more excited, childlike, and joyful about a haircut and the story it tells about the past decade. Today, I am looking at my future with a smile and anticipating New Beginnings of Abundance, Adventure, and Dreams Fulfilled! Tiger, the day before he passed, still so handsome. Last night, my kids got to experience a right of passage most kids do, and few ever forget. They said goodbye to their beloved pet. Tiger died in my arms as Elle, Johnny, and Brett circled around us and spoke love, adoration, thanksgiving, and blessings over him. It was sacred, it was painful and it was beautiful. Unfortunately, my kids are not new to grief and death. They vividly remember our two late miscarriages from 2015. However, this is the first time they have watched a living being pass away and lost someone they knew well and dearly loved. As a parent, I couldn’t be more proud of them for keeping their hearts open and experiencing the grief, but I also could not be more heart broken for their loss. Friday, we noticed Tiger was looking really skinny and hadn’t been eating well all week. He is young and healthy, so we assumed we’d have him for 18-20 years and pictured him dying after we sent the kids off to college. It never occurred to me that he could get sick and pass away now. Needless to say, the past two days have been a shock. Saturday, we took him into the vet for an annual checkup and walked out three hours later with a terminal diagnosis of kidney failure. We could have run hundreds, maybe thousands of dollars of tests to get more answers, but the simple X-ray and blood work they did confirmed his kidneys were far enough gone that it would be nearly, if not totally, impossible to reverse. “A few days to a few weeks” was the best they could tell us. We decided to take him home and give the kids time to process a goodbye since he didn’t seem to be in pain. The doctor gave him IV fluids and a B12 shot and told us to call if/when we needed anything. Sunday, we came home from soccer to find a weak kitty that didn’t want to move. He purred every time we pet and snuggled him while the kids continued to cry a river and process all their questions. We knew we might be looking at euthanasia in the coming days if he continued to decline this fast. To our shock, at 9:30pm, Tiger walked over to the corner of the room, laid down, and began to cry out in pain. I couldn’t bare to let him suffer so we woke the kids and headed to the emergency vet for a merciful euthanasia. As we headed out, Johnny gave his beloved baby blanket to Tiger to comfort him in his last moments. Elle asked to hold him on the drive wanting to be close enough that he could hear her profess her love. For the 30 minute drive, I watched my kids deny their fear of his death and choose to press into love and pain of loss in order to comfort their beloved kitty as he cried out. It killed my heart to see my kids and Tiger hurt that way, but it was also an incredibly beautiful and sacred moment. Love is worth it. Opening our heart to love leaves us open to pain and hurt, but it is worth it. This morning, a sweet kiss from Jesus came in the form of a small snowfall that resulted in a late start to the school day. We went out back in the cold crisp sunshine, it was beautiful. Elle picked the spot, Brett dug a hole, we all decorated Tiger’s burial box with love notes, and Johnny carried him out to where we said goodbye forever. Johnny asked to say a final prayer and we all walked back into the house full of peace and appreciation for it all: the beautiful, painful process of having, loving, and saying a sacred goodbye to our beloved Tiger. Brett digging a hole where the girls picked a spot. Teaching truths about healthy community and process is vital. We are always checking to be sure that our own family feels loved, full of joy, and has safe space to deal with pain. Having FUN with our teens- and essential to healing hearts! Wednesday evening, as Brett and I met with our team of youth group volunteers, we were informed that 17 people had been shot and killed that afternoon at a Florida High School. We chatted about it quickly, prayed and headed out to greet our teens for Wednesday night church. As the night wore on, I was continually grieved to think about how close to home this is. Our students span over six different public high schools, and multiple homeschool tutorials. Any one of them could have had this horrific shooting happen at their school that day. Thankfully, they didn’t. But what can I do about it? My aunt in Colorado posted the above question to Facebook with rules about responses needing to be respectful, specific, and personally owned. Within our team, we call this being “Solution minded, not issue focused”. It inspired me to share some thoughts I have been processing about the topic of gun violence and school/mass shootings. I grew up hunting my whole life. My dad taught me gun safety from as early as I could hold a gun up. I was taught to respect the weapon and the animal life we took with it for our food. I am in no way anti-gun, nor am I afraid of the guns themselves. I don’t actually think guns are the problem AND I believe we should have more wisdom poured into our laws for gun ownership. Personally, I believe hurting people are the problem. We have a saying at our church that our little family lives by, “Hurt people hurt people. Healed people heal people.” You’ll frequently hear us asking in our home, “Are you hurting or healing people right now? What does that say about what’s happening in your heart? What are you needing right now?” My kids will ask each other, Brett and myself this, too. We have committed to checking in with our hearts and others, and doing everything in our power to help foster a safe environment to work through our heart hurts and bring healing to pain. Personally, I believe the problem we actually have at hand is that we have too many hurting people walking around lonely, tormented, fearful, disillusioned, and filled with fantasies of revenge because they have no safe place to face their pain and are isolated from healthy community that brings love and healing. We all face hard moments in life. Everyone has been embarrassed, bullied, experienced loss or hardship. Death and sickness are no respecter of persons. We all experience these painful moments of life. But the difference is do we have people and healthy community around us to help process it? Are we given space to grieve loss, with love to help hold us? Do you have someone there to validate your pain from embarrassment or loneliness at a new school, job, etc.? Or are you left alone to let fear build up, pain harden your heart, and bitterness to take over? Are you a hurt person who is going around hurting people? Or are you a healed person, spreading love and fostering healing to those in your community? The truth is, you are doing a mass shooting of something to the people around you already, but is it a pouring out of love, forgiveness, kindness, and blessing OR are you spewing hate, condemnation, accusation, and making everyone around you walk on eggshells? Check your facebook posts, consider your most frequent conversations. Are they building others up and instilling confident love, or spraying others with slime of gossip and pointing the finger? None of us get this right all the time, but even when you do catch yourself making a mistake, are you humble enough to apologize and seek forgiveness? Brett and I have dedicated our lives to Christ. In doing so, He asked us to spend this season of life loving our teenagers. We spend our waking hours praying for our teens and their families, planning safe and fun events where they can come enjoy life and feel safe enough to share their burdens. We create sermons and teachings about healthy community and call our teenagers, team, and ourselves to a higher standard of loving others well, even at the cost of our own comfort. We teach about healthy grief and make space in small groups for our teens and team to share their burdens with one another and allowing them to be exactly where they are in their process. We do NOT always get it right nor are we perfect at any of this. But our dream and goal is to point people to the love of their Savior and have a lot of fun doing it. I cannot tell you how many times teens have told me that they were struggling with thoughts of self harm, suicide, etc, but then when they came to youth and realized that someone cared about them, they realized they never actually wanted any of those things. They simply needed an outlet for the pain and didn’t see any other options in the moment. So what can you do? It doesn’t need to be a huge grandiose gesture of political change, or even something public. Maybe start with yourself. Are you healthy, considering your mind, body and spirit? What’s one thing you could do today to be kind to your own heart? Then move on to your family. Do they feel safe to share with you? Maybe ask them how they experience you and what they need from you. Be safe enough for them to share and create a policy in your home of choosing to be healed people who heal people with love (this is a process by the way, not a destination or something we master). Finally, how can you get involved in your own community? How can you be someone for somebody? Each one of us has our own unique calling and purpose. Yours does not need to look like mine, nor mine yours. Ask God, “Who is my people group?” You may realize you already knew or maybe, like me, He will surprise you completely. I never dreamed once that I would be a Youth Pastor. However, one of my greatest discoveries this year has been that I never loved myself as a teenager. Through this position, I am coming to the truth that teenagers are INCREDIBLE! Teen years are meant to be full of joy and adventure. As teens, we should be delighted in by our parents and the world. I now look back at teenage Shailey and have a joy and love for the hurting girl that had no clue how wonderful she is/was. As I have come to a place of healing for my own teenage self, I get to bring healing to my teenagers as well. It is a honor and joy. If you have never worked with children or teenagers, pray about getting involved. Sowing health, truth, and love into the youth of today will create a healthier and more loving future for all of us. So what can you do today to make a change to stop mass shootings? Ten years ago today, I woke up hung over. I had been on a nearly forty day binge of drinking to numb my pain, confusion, shame, and heartbreak. As I sat up out of bed, I audibly heard the voice of God say, “Knock it off.” The fear of the Lord overtook me as I sobered immediately. I didn’t know what was going on, but I knew I’d never be the same. I realized recently that I hadn’t yet written about this part of my testimony in depth. However, I have been overcome with thanksgiving this month as I have reflected on my ten year journey with the Lord and I know it is time to be released. Our God, the creator of the universe, is the most intimate and intentional person we could ever know or come to love. Jesus Christ changed my life forever and I am delighted to share. In 2007, Brett and I were still in our first year of marriage. We both had some serious drinking problems and spent six of our first twelve months of marriage apart. In this time, we both got into mischief and our relationship was mostly non-existent. I worked hard to keep up a facade that everything was perfect. He’d signed a contract with the Jets and had moved to New York. I stayed behind in Utah to finish my degree. Brett was out living up the single life with the other rookie players and I was at home wrestling with jealousy, pride, control, anxiety, and much more. By the time I arrived in New York at the end of the summer, our marriage was a mess. I wanted to get into Law School as quickly as possible and needed to prove my worth to the world with my accomplishments, and Brett seemed to be in the way. Within weeks of my move, I was asking for a divorce. Then, I found out we were pregnant with our first child. Then, on November 8th, 2007, my whole world was rocked. The baby I had just started falling in love with was gone and so were the tiny bits of hope I had gotten excited about. The doctor told me not to worry, that this is far more common that people think. Problem was, I didn’t know ANYONE who had had a miscarriage like this and I felt completely alone. On the drive home, I clearly heard messages of shame in my mind. My own voice turned on me and told me lies about how it was probably my fault because I didn’t want the baby in the first place. As I started texting my family and friends to let them know I’d lost the baby, shame and fear consumed me. I couldn’t breathe and I certainly couldn’t face it all. As we pulled into our little neighborhood, I told Brett to stop at the liquor store. I purchased all the vodka I could and headed home to drown out the voices that were screaming of my failure. Sobered and shaken, I started by walking downstairs and dumping every drop of alcohol I had down the drain. I had been learning about God from the other women at the Bible study Brett initially drug me to, but I didn’t know or trust Him. I was afraid He might strike me with a lightning bolt or something, and I didn’t want to risk it. Next, I called a friend from the Bible studies who had told me she had a drinking past. She came over and I outed myself. I told her about my drinking and she prayed with me. The next ten days I spent feeling pretty ill and wondering what was next. Then on Christmas morning, ten days later, I found out I was pregnant again, this time with our daughter, Elle. I will never forget that morning. First, I had delight and relief. I could get pregnant again! Next, I felt fear of what would happen and what if I did damage to the baby with my drinking? Then the sobering reality hit me like a ton of bricks. 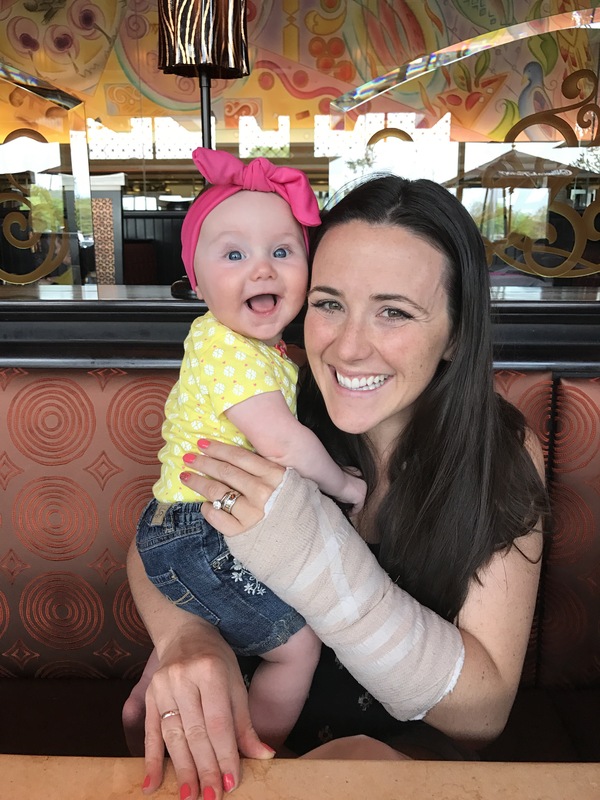 God stopped me from drinking and ruining this baby’s life! I had no clue I was pregnant (nor how far along I was yet) and I was drinking myself away, thinking it only affected me. But here I was, carrying the life of another, and God in His incredible mercy intervened and got me to stop drinking! I had no clue what to do with that. At that time, I lived by the law of justice. You get what you deserve and you deserve what you get. You make choices and live with the consequences. I chose to drink heavily and should have had to deal with the consequences of possibly losing another child. Instead, He spoke to me, woke me up, and saved the life of this baby. I didn’t know yet that mercy is getting what you don’t deserve and not getting what you do deserve- but I was fully experiencing it! That day shook every paradigm I lived by at my core. I spent the next couple of months earnestly searching, trying to find this God that was clearly interested in my life. 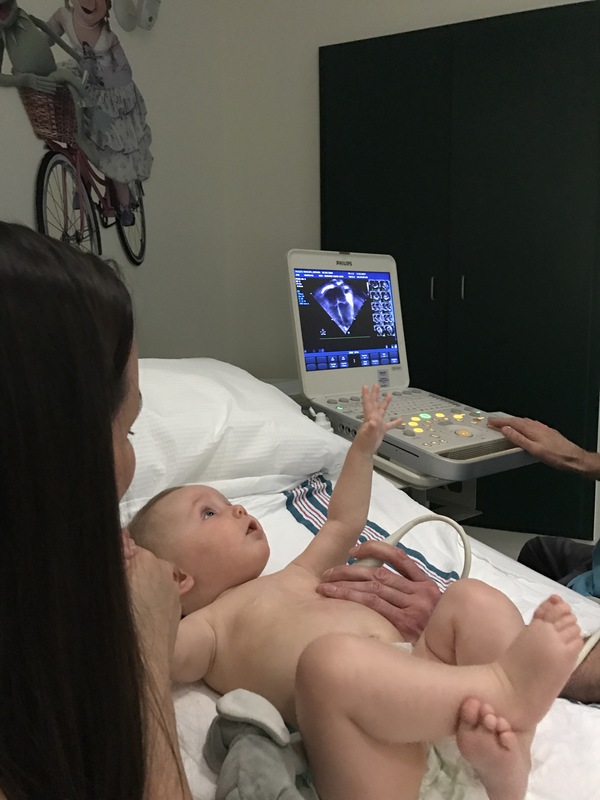 In early January, we had our first ultrasound and found out the baby was healthy, growing perfectly and that it was due in August. We lived in constant fear of another miscarriage and never spoke of the child we’d lost. We didn’t know how. It felt best to simply move on, but neither Brett’s nor my heart actually could. In February, another couple sponsored us to attend a Christian conference for NFL players and their wives. At that conference, Erwin McManus spoke about a man named Jesus who came to save the lost. This Jesus spent His time with the sinners and rebuked the religious hypocrites of His day. It rocked my world, and my heart shifted. I knew this was the God I wanted to live my life for. So with urgency and excitement, I grabbed Erwin as he finished speaking and told him I wanted to give my life to Jesus! He prayed a prayer with me and encouraged me to get baptized when I got home. I told him I wanted to get baptized now and later that day he water baptized me in the hotel hot tub. I truly felt like a new person! As my second pregnancy progressed, I found my heart struggling to attach for fear of losing the baby again, but I remained silent about it. In the spring, another wife on the team pulled me aside. In a small whisper she told me she was so sorry for my loss. She told me she knew my pain because she too had suffered a miscarriage before having her children. I thanked her quietly but inside, I raged. I was so angry that she waited so long to say this. I had spent months struggling with the lie that I was the only one who knew this pain. The shame of being the one defect woman in the world that lost a baby was swallowing me up, and here she could have said something, but waited for months. I realized that day how important it is for us humans to know that someone else can relate to our experience, that we are not the isolated issue, but that someone else can truly empathize with our situation. I decided then that I would speak out loud about our loss. Shortly after, I went in for the twenty week ultrasound. This is the one you find out the gender and ensure that growth and development is okay. I was nervous. What if they did find a defect of some kind due to my early drinking? Would I ever be able to live with myself? 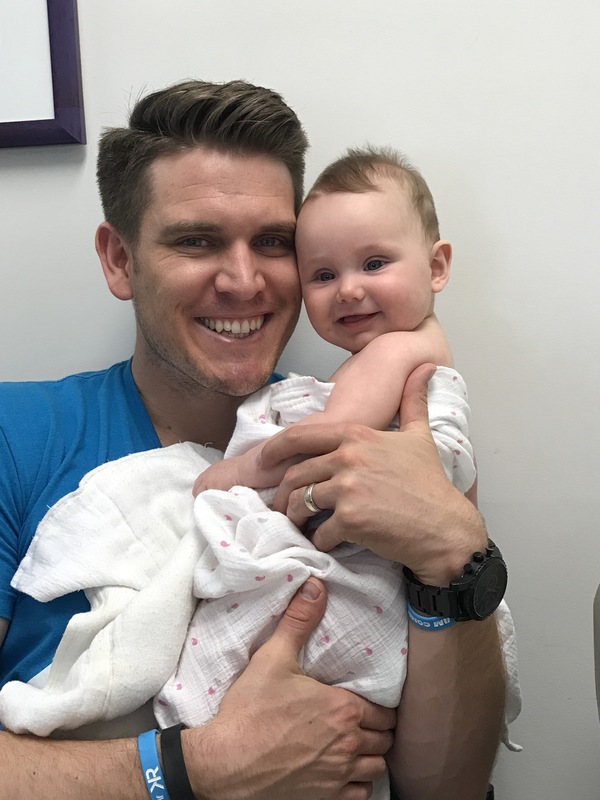 As the tech counted ten perfect fingers and toes, all the organs, and every other perfect little part of my beautiful daughter, my heart was overcome with relief, love, and gratitude. God truly had saved my baby and blessed me with a princess. That night, I had a dream of Elle. In the dream, I was holding her, nursing her, and protecting her. It was the first kiss of unconditional love I’d ever really understood, and I knew I’d never be the same. That fall, on 8/8/2008, our precious Ellenor Shai was born on Brett’s birthday. It was truly the mark of New Beginnings. I’d given my life to Jesus, our daughter was born healthy and perfect, and our journey of coming to know the Father’s love was well on it’s way. In the years since, God gave us Johnny Brett, resurrected and redeemed our marriage, and took us on a wild adventure of six teams and six years in the NFL. Next, He introduced us to our greatest helper and friend- Holy Spirit, taught us about inner healing, called us to full-time ministry in Nashville, and invited us to have more children. Jesus walked us through two more miscarriages when Timothy Luke and Evelyn Ruth graduated to Heaven (which brought us full circle to actually addressing our loss of Nathan Darrell and healing our hearts fully from these losses) and eventually gave us our sweet rainbow baby, Esther Hope. As I close, I sit here sobbing with thanksgiving and wonder. Ten years ago, I had no hope. I didn’t even understand what hope could be or mean in my life. Today, I have suffered more loss and endured pain beyond what I thought I could ever handle, yet I am fully alive, awake to the beauty of love and loss, and completely filled with a restored HOPE that I never thought possible. In a decade’s time, Jesus has saved me from myself and filled me with His love. He is my Rock, my Comforter, my Savior, and my Everything. There was a point in 2009 that I was faced with choosing my way or seeking after His (because I still didn’t really know what it was). It was time to make a decision and never turn back. I bought myself a wedding band for my right hand and had “I choose Him” inscribed on the inside. Hands down, seeking Jesus’ presence and His way is the best decision I’ve ever made. The past ten years have changed everything and brought a beauty to my world I never could have imagined. I cannot wait to see what He has in store for the next ten years, because I am truly filled with Hope: the confident expectation of good. I’ve waited to post because I needed a moment to process the sanctity of yesterday. Six months ago our perfect rainbow baby was born and we thought we were closing the chapter of hardship we’d been in for 21 months. 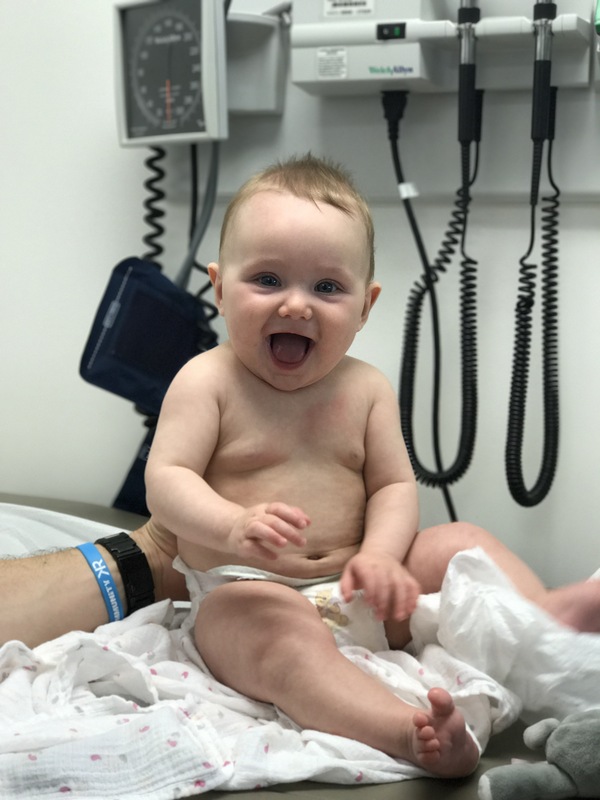 Ten days later, Esther’s pediatrician found a heart murmur and sent us to see a pediatric cardiologist. 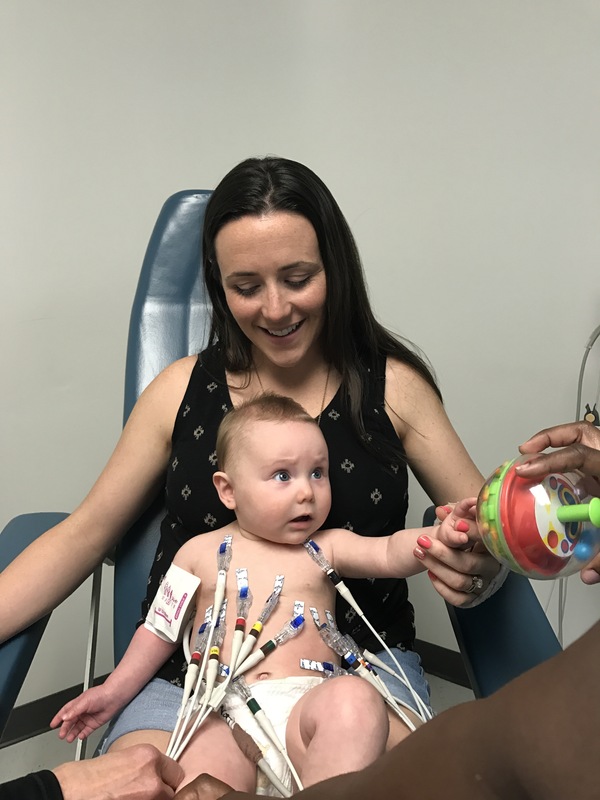 At 13 days old, Esther was diagnosed with a Ventricular Septal Defect (VSD). Thankfully, hers was small, and didn’t seem to be affecting her health. However, this felt like such a joy stealer. We didn’t want to have ANOTHER issue, more medical bills, or another diagnosis to announce and deal with. Despite the discouragement, we chose to stand in a place of peace and hope even though we didn’t feel like it. 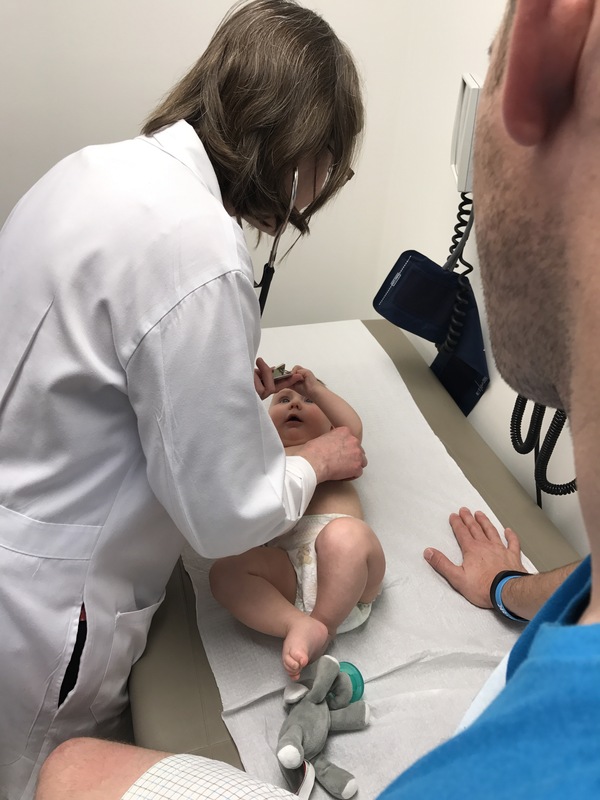 At her 1 month appointment, the murmur was still present. Again, we chose hope and continued to take communion daily as a family declaring her healing. In late November, I was at a meeting with ladies from our church who wanted to pray for Esther. As they prayed, the Presence of Holy Spirit became tangible in the room. Toward the end, Esther manifested physically and I knew in my heart, in that moment, she was healed. At her 2 month appointment, the murmur was gone. We’ve had to wait until yesterday to return to the specialist to run another round of tests to medically confirm Esther’s healing. After the initial EKG, the cardiologist felt the VSD was likely closed but wanted to check that her blood flow issues were resolved. We then went in for another ECHO. The last time we had this test done, Jesus showed up in the room and held Esther and I throughout the test. As I waited for Him again, I noticed Esther began to look up and reach for what appeared to be nothing to the naked eye. Again, I knew Jesus was there, showing Himself to my baby and closing this chapter for us for good. The daffodils we planted in our back yard in remembrance of our Heavenly babies. When we found out two years ago today that our fourth child, Timothy, had passed away, daffodils were in bloom everywhere. It was as if God was speaking to me about life in the midst of death. I cannot look at daffodils now without thinking of my three children in Heaven. Daffodils bloomed early this year in Nashville. We had an unusually warm winter and it confused everyone, including the flowers. The past month has had many thankful yet sad tears as I have continued to mourn the loss of our babies seeing these flowers everywhere, but simultaneously celebrating the sweet baby we do have. Speaking of celebrating, Esther will be six months old on Monday! That is crazy to me. How have six months passed by already? The time has been filled with joy, delight, sweet moments, and constant celebration. All this goodness wasn’t just for our family. I have delighted in seeing our community, family and friends celebrate with us. Everyone who sees Esther loves to ham it up with her and tell us how happy they are for us. Genuine delight comes to everyone who remembers our journey of loss, life, and restored hope over the past two years. Why? Because they too experienced it all with us. So many women do not share when they experience a loss like miscarriage. Don’t hear judgement in that statement- I absolutely understand why! It is so intimate, personal, vulnerable and comes with a plethora of emotions that take time to unfold and process. However, I can say that as we shared our journey with those around us, we found ourselves scooped up in their arms and covered in their prayers. Others cried with us, supported us, and lifted us up. After we lost our fifth child, Evelyn, I felt so broken. I didn’t want to be going through another hardship, let alone announce it! But we did. It is who we are and what we are called to. Living our lives out loud is what Brett and I do. And while sharing our journey did come with some bumps and pains, it mostly let people in to love us well. Then came our sixth child, our sweet Esther. With her pregnancy came prayers and support like you cannot imagine. Because others knew the loss we’d endured, they saturated us in prayers and love. When we had lost our hope, others hoped for us. And when we burst forth from our season of darkness, the moment Esther took her first breathe and screamed out in that delivery room, all of our people cheered with us! We have been on one big celebration train for six months. Everyone loves to see God’s faithfulness, and when we let them see it in our lives they can delight with us. I cannot imagine how different our journey would have looked had we decided two years ago to stay mum about our loss. We’d have walked through it with Jesus and He would have faithfully seen us through, but we would have had to hide so many emotions. The amount of stuffing would have been stifling. Even worse, we’d have had to grieve silently and alone. Then, when our moment of breakthrough came, some of the victory would have also been silent and alone. My point isn’t that everyone has to do things my way. My point is that when we choose to walk our journey out “privately” we actually deny the people around us the opportunity to love us, support us, grieve with us and celebrate with us. I am asking that you don’t deny me this opportunity. As your friend, I would want to know what you’re going through. I want to climb down into that pit with you and cry with you. I want to love you well where you are and then celebrate big with you when Jesus comes through with your victory! Most of all, I don’t want you to go it all alone. If what I am talking about seems foreign to you, then we humans have some room for growth. I know not all communities know how to walk through hardship together- but it IS possible! Jesus came to give life and life abundant. (John 10:10) We are not called to walk through life isolated and alone. He calls us to relationship with Him and with each other. I know for me, the most beautiful part of living my life publicly is the encouragement. I am encouraged when I hear other’s stories of breakthrough and have received so many private texts, emails, and calls from those who’ve been encouraged by sharing in my journey. I don’t have an answer to it all yet, but I know He does. And in celebration of the life of my son today, on the two year anniversary of his graduation to Heaven, I ask that you let someone in that you trust. Whatever you’re going through, don’t do it alone. Don’t deny me and others the opportunity to support you, celebrate with you, and be encouraged by His faithfulness in your life.